A watershed is an area of land where water collects to flow into a river, a lake, or another large body of water; we all live inside a watershed. 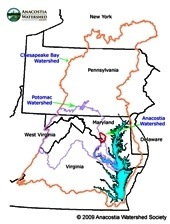 Potomac River and Chesapeake Bay Water Resources and the Environment. Green Infrastructure for Coastal Resiliency Maryland Ecosystem Enhancement Program and Water Trail Guides. 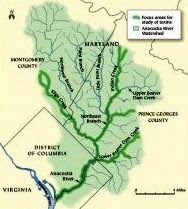 Anacostia River Watershed 176 square mile area of land encompasses most of the eastern half of the District of Columbia and large portions of Prince George’s County and Montgomery County in Maryland. The Anacostia has 13 major tributary creeks and streams - many with their own sub-watershed citizen advocacy groups; it starts near Bladensburg, MD, and runs for 8.5 miles before meeting the Potomac River at Hains Point in Washington, DC. Wildlife The Anacostia River supports 188 species of birds and nearly 50 species of fish. Some of the animals you can see in and along the river include: bald eagles, beavers, white perch, ospreys, striped bass, cormorants, crayfish, herons, turtles, egrets, otters, herring, red fox, shad, kingfishers, and bullhead catfish. Pollution and its Effect of Fish Species Each year, Washington's antiquated combined sewer system dumps over 2 billion gallons of raw sewage and storm water directly into the river. Recent efforts have begun to reduce this overflow volume. According to the National Oceanic and Atmospheric Administration (NOAA), more than 20,000 tons of trash and debris enter the Anacostia's waters each year. Between 1989 and 2009, AWS volunteers collected and removed more than 850 tons of trash from the watershed. Experts estimate that approximately two-thirds (2⁄3) of brown bullhead catfish in the Anacostia River have tumors. The bullhead is an environmental indicator species for the Anacostia. Westernport and ends in Cumberland. Distance: 32 miles. Upper Potomac River Washington, Frederick, and Allegany Maryland + Jefferson County West Virginia. Start and End Point: The route begins in Shepherdstown, West Virginia and ends in Cumberland Maryland. Distance: 115 miles. Middle Potomac River Located in Montgomery, Frederick, an Washington Counties. Start and End Point: Georgetown, Washington D.C. to Williamsport, Maryland. Distance: 92 miles. The Potomac River and the Chesapeake and Ohio (C&O) Canal feature recreational fishing, biking, hiking, kayaking, canoeing, camping. Lower Potomac River Prince Georges, Charles, and St. Mary’s counties. 115 miles of the lower Potomac River from Washington DC to Chesapeake Bay. Other Southern Maryland Trails Anne Arundel, Prince Georges, Calvert, Charles and St. Mary’s counties. The region of Southern Maryland is a peninsula bordered by the Potomac River to the west and the Chesapeake Bay to the east. Predominantly rural with areas with dense population and suburban development closer to the Washington D.C. area. Steep cliffs can be found along the Chesapeake Bay shoreline and along areas of the Potomac River. Most of the streams, creeks and rivers experience tidal influences and have brackish water - a mix of fresh and salt water. Charles County Water Trails along Mattawoman Creek, the lower Potomac River, Port Tobacco River and Nanjemoy Creek. Point Lookout Water Trails Point Lookout State Park - the southernmost tip of St. Mary’s County where the Potomac River meets the Chesapeake Bay. The State Park offers a variety of paddling experiences that range from an hour or two to all-day excursions with overnight camping options on the Point Lookout peninsula. Kingfisher Canoe Trail Prince Georges County, Anacostia River. Set in a very urban environment, this trail features some surprisingly natural areas as it passes by the Kenilworth Marsh and Aquatic Gardens and the National Arboretum. The trail begins at the Bladensburg public boat ramp and continues down the river to end at the Anacostia Park boat ramp. Patuxent River Water Trail Anne Arundel, Prince Georges, Calvert, Charles, and St. Mary’s counties. 110 miles long. Many public parks and launching sites for recreational boating provide additional access for visitors to enjoy the river’s resources.